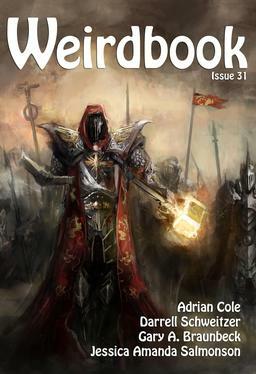 I am delighted to announce that Weirdbook 31, the latest issue of one of the greatest sword & sorcery and weird fantasy magazines in history, is now on sale. New editor Doug Draa, the former online editor for Weird Tales, has done an tremendous job resurrecting Paul Ganley’s classic weird fantasy magazine, and dressing it up for the 21st Century. Weirdbook produced thirty annual issues between 1968 and 1997, publishing fiction by Stephen King, Joseph Payne Brennan, H. Warner Munn, Robert E. Howard, Tim Powers, Darrell Schweitzer, Delia Sherman, and countless others. The magazine was also renowned for its gorgeous interior artwork by Gene Day, Allen Koszowski, Stephen E. Fabian, and many others. This is the first issue since 1997; its new publisher is Wildside Press, publisher of Adventure Tales, Wildside Pulp Classics, and Sherlock Holmes Mystery Magazine. The cover is by Dusan Kostic, and the back cover is a piece by the great Stephen E. Fabian, who did most of the covers for the original run. The magazine is a large digest format on book paper, in the same format at Adventure Tales and Sherlock Holmes Mystery Magazine. It’s available directly from Wildside, from online distributors, and through Amazon.com. The new issue includes brand new fiction and poetry from John R. Fultz, Adrian Cole, Paul Dale Anderson, Darrell Schweitzer, Jessica Amanda Salmonson, Wade German, and many others. Here’s the complete table of contents. Weirdbook is published quarterly by Wildside Press, and edited by Douglas Draa. Issues are 160 pages, and priced $12 for the print edition, and $3.99 for the digital version. Subscriptions are currently not available. This issue’s cover is by Dusan Kostic, with a back cover by Stephen E. Fabian. Learn more at the Weirdbook website.